ArcGIS provided the data storage framework to store, analyze, query, and visualize economic, environmental, and social data across multiple scales. Photorealistic renderings backed by GIS analyses help stakeholders understand the consequences of a particular design. Converting red fields to green fields would strengthen the city's social, economic, and environmental health. Geodesign is about holistic design and communication. It is about easily linking seemingly disparate data into a cohesive graphic language that can tell a story far more powerful than its individual parts. Nowhere is this better illustrated than in the story of how something as humble and democratic as a park could help reverse the country's economic malaise. ArcMap, 2000 Census data, and land use data from both Esri and the Southern California Association of Governments (SCAG) were used to identify three areas that were both park-poor and economically disadvantaged (outlined in black) (From Dakotah Bertsch, Michael Boucher, Eran James, and Abby Jones. Red Fields to Green Fields Los Angeles, Pomona: California State Polytechnic University 606 Design Studio, used with permission). Michael Messner, a Wall Street fund manager and cofounder of the Speedwell Foundation, proposed Red Fields to Green Fields (R2G), a plan for turning distressed properties (red fields) into parks (green fields). His argument is simple—remove the glut of overbuilt and foreclosed properties and redeploy that capital out of underperforming real estate and into green space. It would stabilize property values, strengthen banks, and create jobs. As Messner puts it, "Tearing down can create wealth. Land without buildings should be considered an asset by our financial system." He goes on to point out that the benefits are far more than financial. In essence, parks benefit the "triple bottom line" by improving economic, social, and environmental health of communities. From New York City's Central Park to the City of Boulder's greenbelt, history has shown that parks and open space tend to increase nearby property values; attract tourists and residents who contribute to local commerce; increase public health by providing opportunities for physical recreation and mental relaxation; and perform vital environmental services, such as treating storm water, reducing heat island effects, and improving air quality. Los Angeles was one of 11 cities selected to test the viability of the R2G concept. The Red Fields to Green Fields Los Angeles (R2G-LA) case study was developed by the Verde Coalition with the help of several agencies, including Occidental College's Urban and Environmental Policy Institute; Parks for People; the Trust for Public Land; and California Polytechnic University, Pomona's Landscape Architecture Department 606 Studio (606 Studio). 606 Studio played a significant role in developing the R2G-LA case. Los Angeles is the third richest city and fifth most powerful and influential city in the world. It is also recognized as the most diverse metropolitan area in the United States. However, compared to other large cities within the United States, Los Angeles's parkland falls short both in terms of its percentage of the city's land area and in terms of park acres per resident. While a few large tracts of parkland do exist, parks are not distributed equally throughout the city, being especially deficient in lower-income neighborhoods. Lincoln Heights aggregated capability bar chart map. (From Dakotah Bertsch, Michael Boucher, Eran James, and Abby Jones. Red Fields to Green Fields Los Angeles, Pomona: California State Polytechnic University 606 Design Studio, used with permission). Lack of parks is not the only disparity. Food deserts, obesity, asthma, and other ailments associated with lack of open space and low income dominate in these areas. Poor environmental quality is also highest in these communities. During the recession, property values plummeted everywhere, but disadvantaged communities were hit hardest. Geodesign is also about discovery. It is about reading the landscape to tease out what is most important. It involves assessing the condition of a place and its people working across scales to determine how one region, neighborhood, or number of sites might affect another. Since it is holistic in nature, it requires gathering diverse geographic data covering the natural, cultural, and built environments. To begin the study, data inventories had to be collected and/or created for each level of investigation to meet the informational demands of each scale from the region to the neighborhood to the site. ArcGIS played a significant role by providing the data storage framework necessary to store, analyze, query, and visualize economic, environmental, and social data across multiple scales. To begin the study for Los Angeles, researchers examined the geographic context of the region to determine the highest-need neighborhoods that could most benefit by the improved environmental, social, and economic health resulting from converting distressed properties to open space. Identify the most park-poor areas, defined as having three acres or less of parkland per 1,000 people based on census tract data. Identify disadvantaged neighborhoods, defined as census tracts with a median household income that is 80 percent of the state median household income. 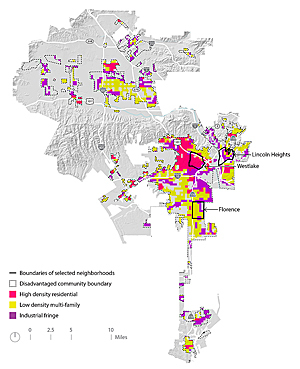 At the regional scale, these two criteria formed the basis of the geodesign evaluation models that would result in the identification of three neighborhoods most in need: Lincoln Heights, Westlake, and Florence. Red fields are parcels of land that, for various reasons, are not functioning at their highest civic capacity. Many are vacant lots, brown fields, foreclosed properties, and run-down or collapsing buildings. Commercial real estate data helped narrow the search down to individual parcels; however, early site investigation showed that many vacant lots and distressed properties were missing from the data. The Studio 606 team surveyed all three neighborhoods to locate, ground truth, and inventory site characteristics for all available red fields. The site inventories provided a much more in-depth understanding of red field conditions and their community context, invaluable for later site design. The total number of red fields found in all the neighborhoods was 138 sites, with a total area of 67 acres. 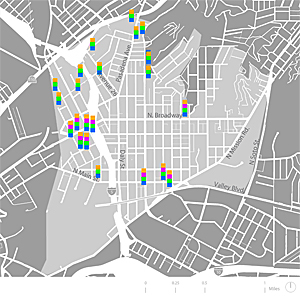 The inventory included relative sun exposure; size; commercial use or zoning; average slope; buildings present; land-use designation; ownership; proximity to the network of planned bike lanes; and proximity to Metro stations and major commercial intersections (nodes), either of which are indicative of higher-than-normal pedestrian use. 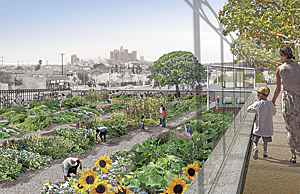 Green field types were developed that address the social, environmental, and economic needs of local Los Angeles communities. The four broad categories of green field types included urban agriculture, recreation, community, and ecology. Urban agriculture green field solutions support food production in the context of the urban environment through community gardening, farming, composting, or production of value-added products from agriculture. Recreation green field solutions refer to parks, sports fields, trails, or other facilities that promote active or passive physical activity. Community green field solutions focus on building community capital through social, cultural, educational, or artistic exchanges by creating plazas or space for community interaction. Ecology green field solutions provide ecological function and opportunities for people to connect with nature, for example, through engineered wetlands, reintroduction of native vegetation, etc. 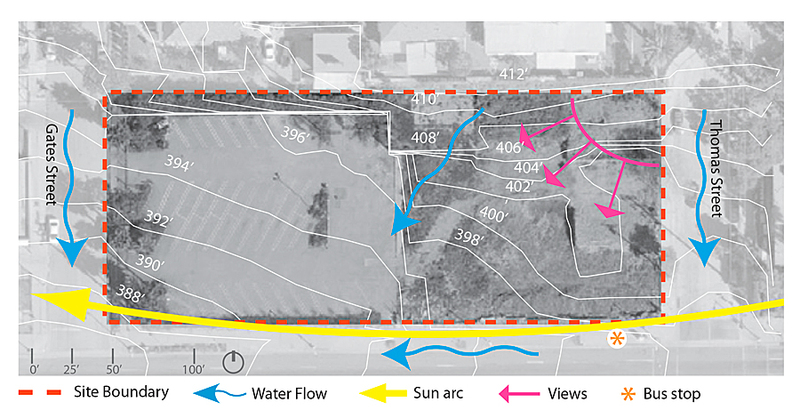 Lincoln Heights Local site selection (From Dakotah Bertsch, Michael Boucher, Eran James, and Abby Jones. Red Fields to Green Fields Los Angeles, Pomona: California State Polytechnic University 606 Design Studio, used with permission). 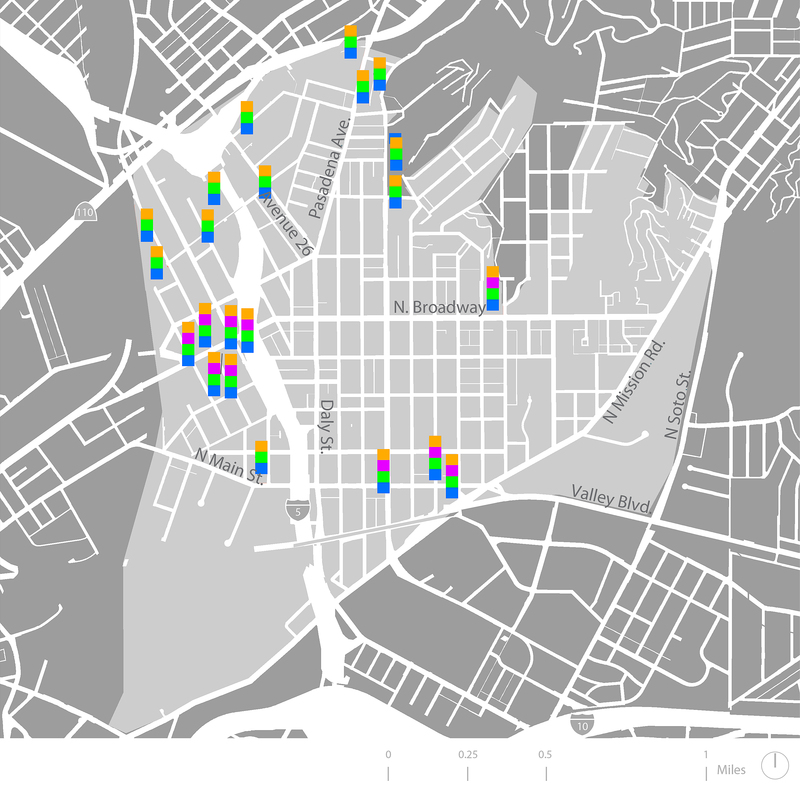 Having identified the neighborhoods of highest need, the next step was to narrow selection down to individual parcels using a suitability analysis. One highly suitable site for each green field type was chosen from the list of suitable sites. However, for the purposes of this article, only one site will be focused on to illustrate how a red field might be converted to a green field—the Lincoln Heights Local red field site. For the rest of this article, Lincoln Heights Local will be used for the green field site development discussion. Lincoln Heights Local, a large red field, is a sloped, vacant lot located on Broadway, a busy commercial street in one of the oldest neighborhoods of Los Angeles. Multiple schools surround the site, including a high school, elementary school, preschool, and kindergarten. An adjacent bus stop on Broadway is heavily used by high school students and other residents. 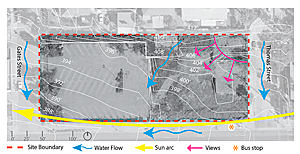 A detailed suitability analysis was performed that showed that a community garden and a farmers' market plaza, representing urban agriculture and community green field types, respectively, were the best fit for this red field, both programmatically and physically, given the opportunities and constraints of the site. The photorealistic design rendering (From Dakotah Bertsch, Michael Boucher, Eran James, and Abby Jones. Red Fields to Green Fields Los Angeles, Pomona: California State Polytechnic University 606 Design Studio, used with permission). Lincoln Heights Local would focus on promoting healthy food options and building community. The community garden would provide plots to surrounding schools as well as other members of the community. The top floor of the community building would serve as an outdoor classroom, while the bottom floor would house garden tools. The farmers' market plaza, with a large oak tree, would host weekly farmers' markets, as well as other community events, such as health fairs, arts and crafts fairs, and flea markets. Built-in seating would enhance the functionality of the plaza and provide people with the option of dining on-site after purchasing healthy food at the farmers' market or meet with friends. Using ArcGIS, CAD, Illustrator, Photoshop, and sketching tools, design renderings of the proposed Lincoln Heights Local green field were produced to better illustrate the design concepts that had been developed for each site. Care was taken to ensure that the designs were appropriate applications of green field solutions to the specific site conditions, as well as to the neighborhood context and regional objectives. Photorealistic renderings backed by GIS analyses and hard data help community members, government officials, and special interest groups understand the consequences of a particular design so they can make better, more informed decisions. Remove 1,300 acres of distressed real estate from the market. Add 1,100 acres of small and walkable parks and increase the ratio of parks per thousand people by 48 percent in disadvantaged communities. Restore 400 acres of habitat in the Santa Monica Mountains National Recreation Area. Create 200 acres of park space along the Los Angeles River. At this time, the results of this analysis are being used to help government officials and other stakeholders build support to fund some of the proposed R2G-LA strategies. Community advocacy groups, environmental nonprofits, and others, are now working with LA officials to find ways to move forward with this integrative approach to solving multiple issues. For more information, contact Abby Jones, Dakotah Bertsch, Mike Boucher, Eran James, or Karen C. Hanna, Department of Landscape Architecture, California State Polytechnic University. For more information on how to put geodesign into practice, contact Mr. Shannon McElvaney, Esri, or visit esri.com/geodesign. This article is adapted from "Chapter 8: Red Fields into Green Fields" from Geodesign: Case Studies in Regional and Urban Planning by Shannon McElvaney, Esri Press, ISBN: 978-1-58948-316-3. Visit esri.com/esripress.